← Outbreak of Riots – Bring Back our Status Bar Text!!! If you were wondering, Yes there is a LISP routine to accomplish the same thing found [here] by Lee-Mac. 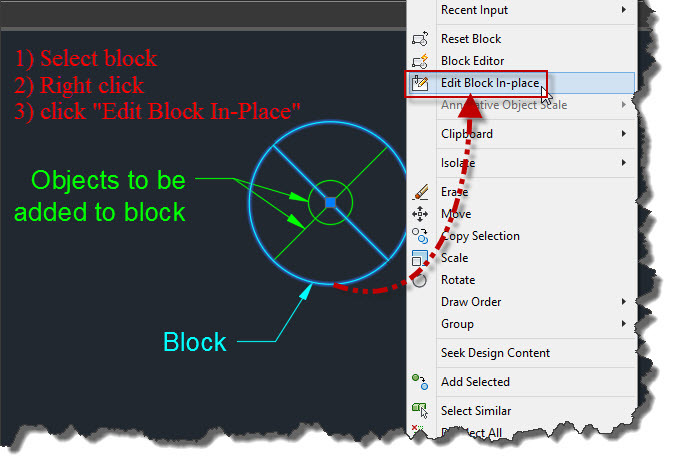 But here is how you can do the same thing using the “Edit Block In-Place” option of editing blocks. Sometimes it is nice to be able to draw objects that will eventually be added to a block without having to draw them in the block editor. Shown below, there is a circle and line (green) that needs to be added to the block (cyan). 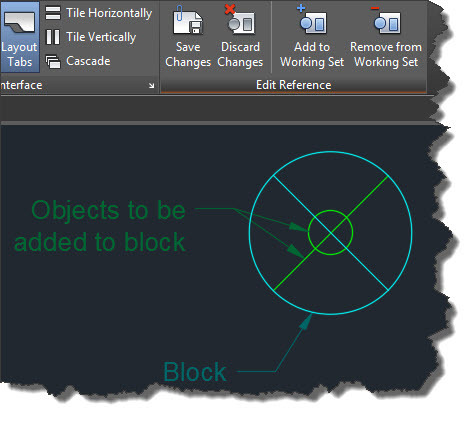 Here are the steps to add these objects to the block. Verify the Block from the list and click OK. 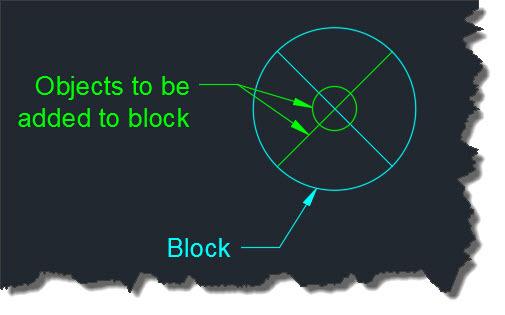 Shown below is what the Block and its surrounding objects look like. The Block’s objects are shown normal while the surrounding objects are dimmed. 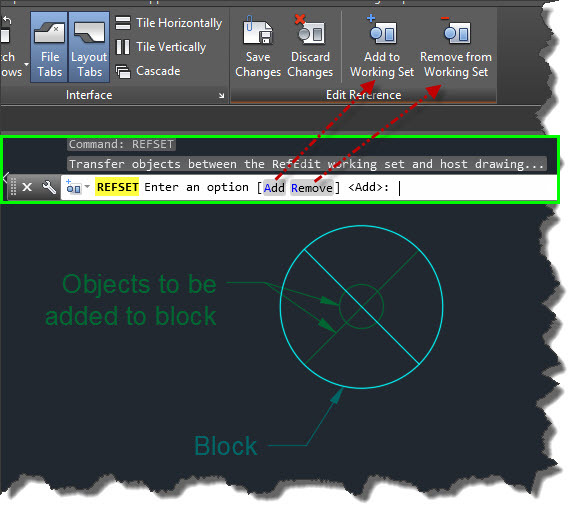 Once in the REFEDIT command, you can use the command REFSET which has an “Add” & “Remove” option. 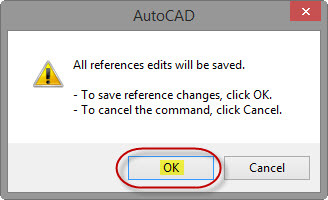 These options are easily accessible from the ribbon, Simply select the corresponding button to add or remove objects. 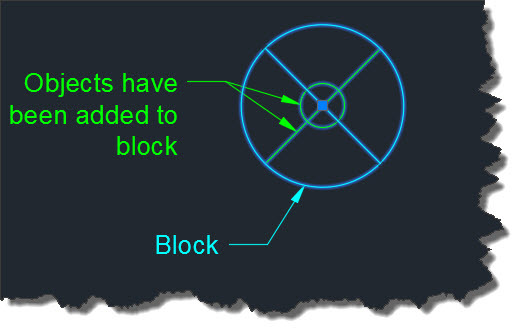 Once objects are added to he block, they are no longer faded. 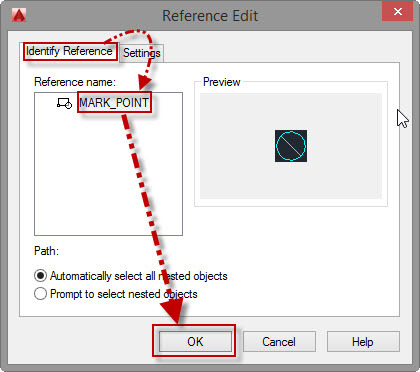 Once you are done adding or removing objects you can save these changes or discard them by using the buttons in the ribbon shown below. Now your edits have been saved you can see them in your block. This entry was posted in Blocks, TIPS. Bookmark the permalink.